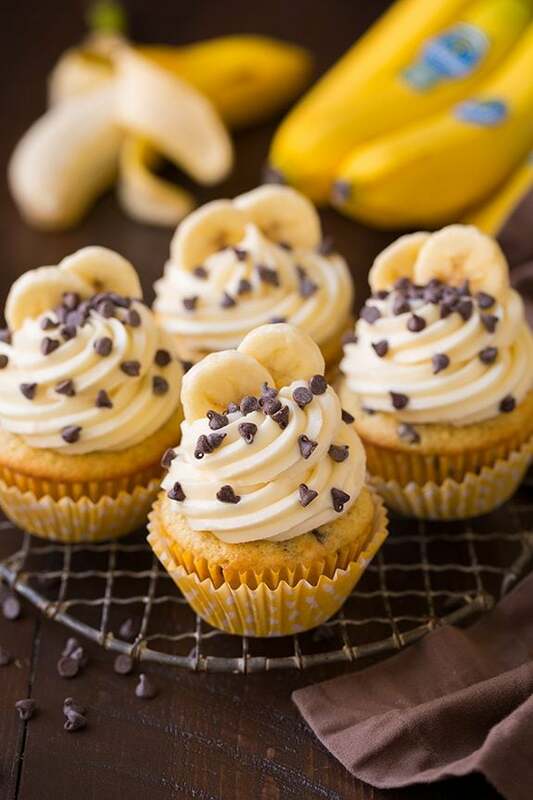 Here you get a soft, moist, perfectly sweet banana cupcake that’s dotted with a fair amount of mini semi-sweet chocolate chips throughout and it’s topped with a decadent cream cheese frosting. You could even take it one step further and top it with chopped pecans or walnuts to add a little finishing crunch. I have to plan ahead if I plan on baking with bananas and buy double because they really go that fast around here. 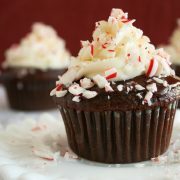 I’m glad I bought plenty so I could make these cupcakes because they are over-the-top delicious! They are rich yet they are a cupcake all ages will love. I mean how could you go wrong here? Bananas, chocolate and cream cheese, they’ve just got to be good! If you aren’t crazy about frosting you could probably get away with half of the frosting recipe, it does make quite a bit, but if you’re like me and can eat cream cheese frosting by the spoonful then just make the full batch :). I made these banana cupcakes with none other than Chiquita bananas. 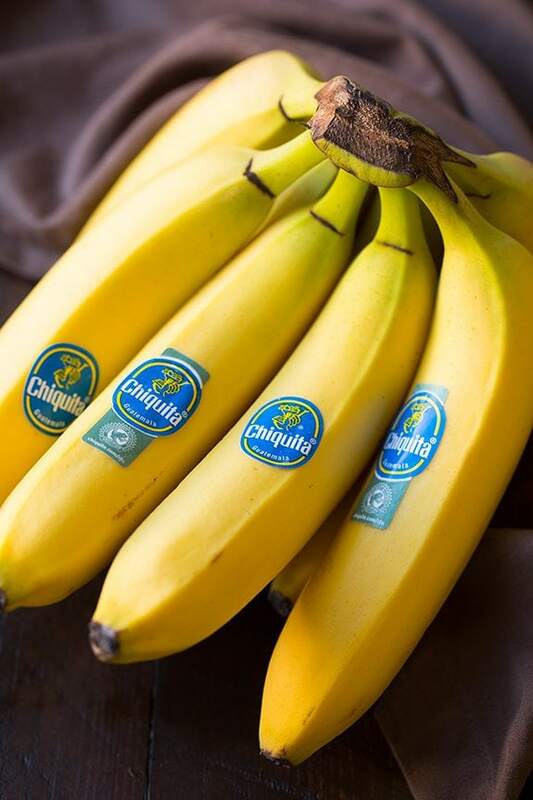 We all notice those infamous blue Chiquita labels and when you’re local grocery store has them stocked you know you’ll be getting delicious bananas your whole family will love! I can’t even count how many bananas we go through a week at my house and my family absolutely loves Chiquita bananas! They are perfect to eat all their own of course, but they are also amazing in green smoothies, over ice cream sundaes, and if they’ve lasted long enough to become generously spotted and overripe, they’re perfect for adding to baked goods. More Tempting Banana Recipes To Try! 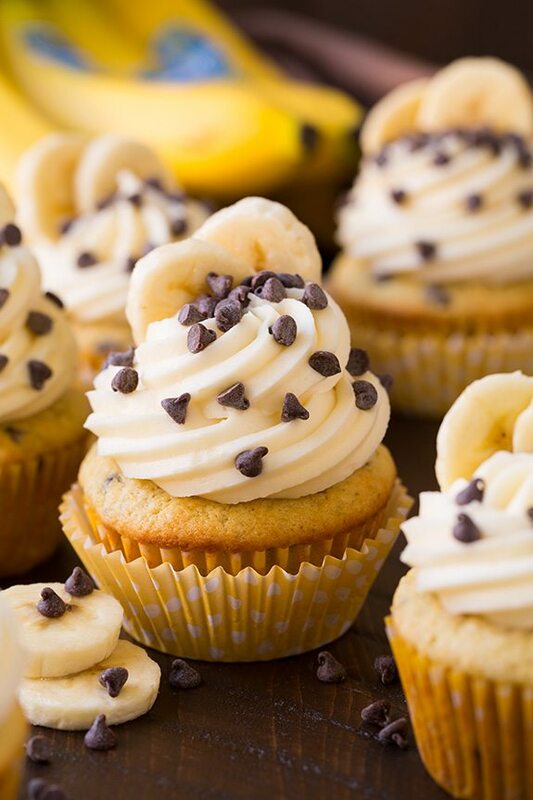 A moist and delicious chocolate chip studded banana cupcake. Finished with a rich cream cheese frosting for even more decadence! A great way to use up overripe bananas. For the cupcakes: Preheat oven to 350 degrees. In a mixing bowl whisk together flour, baking soda and salt. In the bowl of an electric stand mixer fitted with the paddle attachment, whip together butter and granulated sugar until pale and fluffy. Mix in egg then mix in egg yolk and vanilla. Blend in mashed bananas. Add 1/3 of the flour mixture then mix just until combined, pour in 1/2 of the buttermilk and mix just until combined, repeat process with flour and buttermilk once more. Finish by adding in remaining 1/3 of the flour mixture and the chocolate chips and mix just until combined. Scrape down sides and bottom of bowl and fold batter. Divide batter among 12 paper lined muffin cups, filling each about 3/4 full. Bake in preheated oven until toothpick inserted into center of cupcake comes out clean, about 20 - 25 minutes. Cool in pan several minutes then transfer to a wire rack and cool completely. Once cool frost with cream cheese frosting, top with 2 banana slices (just before serving) and sprinkle with chocolate chips. Store in refrigerator in an air tight container and allow to rest at room temperature about 5 - 10 minutes before serving. For the cream cheese frosting: In the bowl of an electric stand mixer cream together cream cheese and butter until smooth. Mix in powdered sugar and blend until light and fluffy (if needed chill in freezer in 3 minute intervals, stirring between intervals until a more firm consistency is reached). This post was sponsored by Chiquita bananas, however all thoughts and opinions are my own. Kelly: These look and sounds AMAZING! Yum!